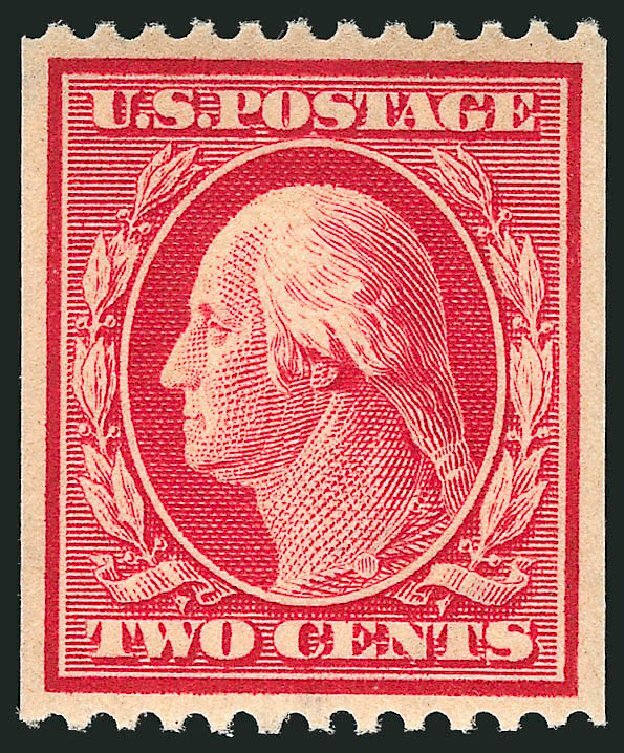 USA (Scott 386) 1910 WASHINGTON COIL 2¢ CARMINE, PASTE-UP PAIR Paste-up pair with plate number on tab. Fresh, MINT never hinged, fine. Cat value $650. 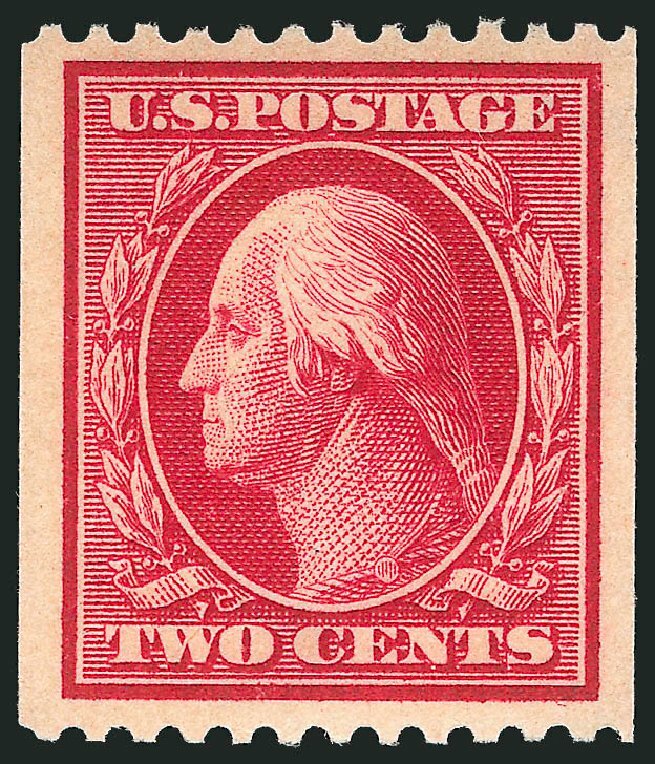 USA (Scott 386) 1910 WASHINGTON COIL 2¢ CARMINE, PAIR One of the finest we have seen, despite the cert which cites a pulled perf at top and a small crease in the bottom stamp which is barely visible, even in fluid. Rich color, lightly canceled, extremely fine centering. (2014 PSE Cert #01289365) Cat value $400. () U.S.; General Issues, 1910, 2¢ Carmine Coil, Line Strip of 4, #386, unused, “light crease on first and third stamp”, Fine to Very Fine appearance, APEX (1998) cert. Scott $1,860. Estimate value $300-350. 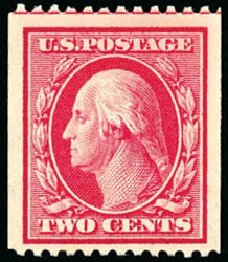 1910, 2¢ carmine coil (Scott 386), guide line pair, o.g., very lightly hinged, immaculate example of this terribly difficult flat plate coil issue, with gorgeous rich color, Fine, 1988 P.F. certificate. Scott $1,600. Estimate $600 – 800. 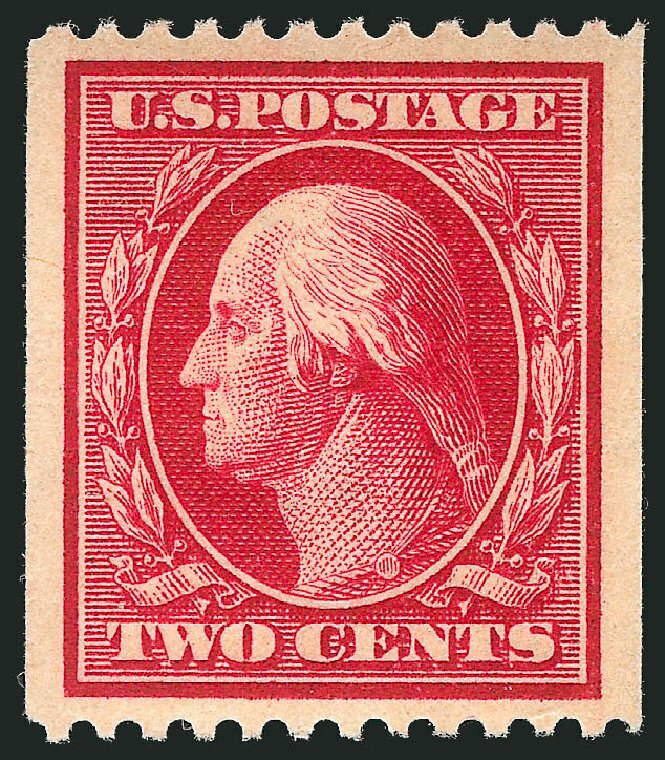 1910, 2¢ carmine coil. O.g., never hinged, wide margins, fresh and Very Fine, with 1993 P.F. certificate. Scott No. 386; $280. 1910, 2¢ carmine coil (Scott 386), guide line pair, o.g., never hinged, one of the most difficult coils to find genuine, as these issues are so scarce that a plethora of fake examples have saturated the market over the past few decades, a rare opportunity to acquire a genuine example of this terribly difficult coil in a fantastic state of preservation, Fine. Scott $3,500. Estimate price $1,000 – 1,500.